Discussion in 'Archive' started by Artchem, Feb 1, 2019. You have asked me to publish the calendar of events and here it is! But let's make some things clear. The goal of the calendar is to help to organize your game-time better. And you have to understand that it is a preliminary schedule. Some of the events might be rescheduled or even cancelled without prior notice. So if you make any decisions on the calendar, you do it on your own risk. Each of these points will be described in a more detailed way in a separate topic at the moment of the release. The calendar will not be posted anymore in case of negative feedback. Thanks for your understanding. Fishing time January 16 ~ February 6 Monkey Chef arrives for several days to Elmoreden and brings exotic flavors to freshen up this severe world. 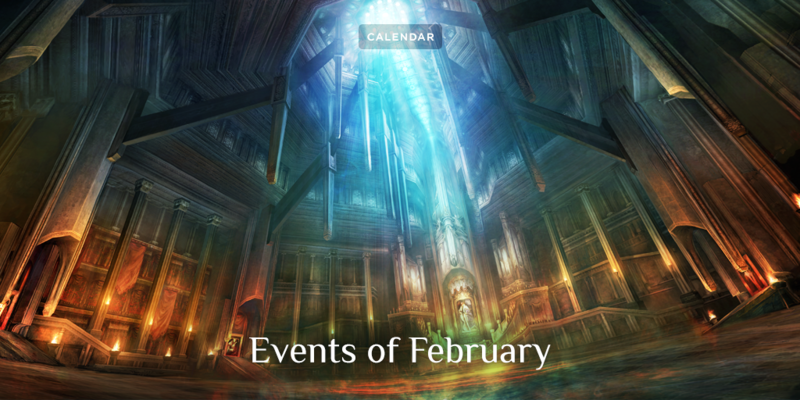 Attendance Event February 6 ~ March 13 Players will receive rewards upon logging into the game every day. Rewards will become more valuable every next day. Royal Love February 13 ~ 20 It’s a sad story of prince Frintezza. He roams the world and tries to find the female warrior, who has stolen his heart. Frintezza is ready to share sweets with anyone, who will reverence the charmed prince and help him in his quest. x2 rates February 27 ~ March 13 Players will obtain double EXP and SP by killing mobs during the event. *There isn't information about future offers. KSERW, Italianomedio, ★Bad★ and 12 others like this. SaMaNoSuKe and Artchem like this. This update is wonderful! Please do this every month. It would help us enormously. Quick question. Is the "double" exp/sp a true double as in twice the total, or is it only 100% of the base? This makes a huge difference if we are using exp/sp boosts. Thanks for answering. Well, in the last 3 1.5x exp boost we got "base exp boost"
so if a mob gave you 100 exp, with 1.5x exp boost, it will give you 150 exp, and then all your exp boosters you may have will make effect. So a 10% fish gratitude will give you 15 exp points extra instead of 10 exp. Budinoide, thanks for the detailed reply. I saw two possibilities. Assume exp was 100 and you were getting a bonus 100 from exp boosts, so 200 total. Either the 100% meant 100% of the base, an additional 100, for a total of 300. Or the 100% meant 100% of the total, an additional 200, for a total of 400. I'm not sure because I think we were using different nomenclature but if I understand you correctly, the 100% is added to the base before bonuses are applied, after which the bonuses are applied, resulting in 100% of the total or 400. Is this a correct reading of how it works? Thanks. Is this a correct reading of how it works? Thanks. (Base exp x event) x all your boosts! Good thing we will have attendance event first, so you can get some juicy 100% scrolls and runes. I guess i dont have to tell you to save those boosters for event, right? Not my first rodeo, cowboy. But thanks very much for the advice and for setting me straight on how things work. So fishing event will come w l2 store fishing?! Not clear on your question, but the fishing event is the one currently taking place. It ends Wednesday. The only L2Store part is the ability to buy a rod and boost from the L2Store and combine their benefits with the overpriced tuna bait for maximum benefit. Thankfully, none of the upcoming events as described seem to have an L2Store component. I hope that's true. Well, sometimes I really wounder what people think is going to happening to Skelth now that we lost 50-60% of the payed accounts, do to Loop removal [45%-50% there] and the opening of NC West Classic [5 - 10% there]. Yes Skelth gained new players in the last months but they are to less to compensate the lost. All I know is that Skelth is far better than the mess that is NA Classic. I would expect more people to migrate from there to here over time. I'm curious, though. Your post as very specific percentages. What is the source of your knowledge? Thanks. All I know is that Skelth is far better than the mess that is NA Classic. I would expect more people to migrate from there to here over time. I think and hope the same. Your post as very specific percentages. What is the source of your knowledge? +-5% is not specific at all. The source are two simple numbers that i write down nearly every day in an excel sheet and these two numbers are visible for every player. Okay, I'll bite. Where can I find these numbers? afaik skelth has no online numbers. At least no oficial source. third: In the beginning try to write down the numbers multiple times per day to see the changes in the hours and then pick one or two times per day you think are ok for your statistics.